A new image of Saturn shows a huge storm seen previously by amateur astronomers. 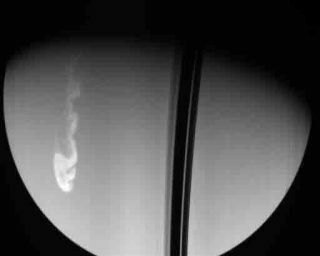 Storms on the gas giant planet Saturn are common. This storm, in the ringed planet's southern hemisphere, was photographed by NASA's Cassini spacecraft Friday; the image was released today (Dec. 27). The photo is unprocessed, or raw, as astronomers described it. "This storm had been sighted by the amateurs in recent weeks, but Cassini was finally in a position to take a splendid series of pictures of it," said Cassini imaging team leader Carolyn Porco. "And what a storm it is!" Cassini launched in 1997 and arrived at Saturn in 2004. It has been imaging Saturn ever since.